I share my Donors Choose Story for Podcasting in Class! My Awesome Supporters! Become a Patron today! - Will you be the lucky 20th Awesome Supporter? 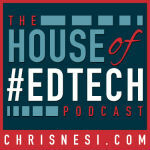 (14:08) Featured Content - My DonorsChoose.org Podcasting Success!